One of the biggest challenges I have with Chinese restaurants is their minimum seating requirement. This can be up to 10 pax in older days but it has shrunk to a more reasonable 2-5 pax in recent years. 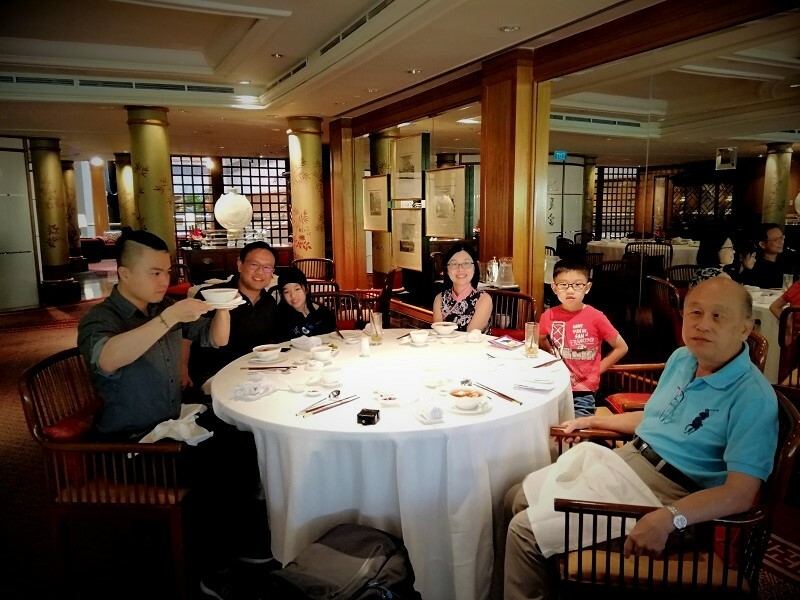 I wanted to try the popular Weekend Brunch Menu at 1 Michelin Star Summer Palace, but it requires a minimum of 4 pax to order it. This means I must convince my sister and her family to join me! Good thing she was up for it. I was 1 hour late to lunch coz I took the wrong bus. I must be the only person ever to take a bus to a Michelin starred restaurant. Haha. My sister drove here but I wanted to get something important done (i.e. sleep in) so I came separately. The Weekend Brunch Menu (SGD 56 per pax) started with a complimentary appetizer. 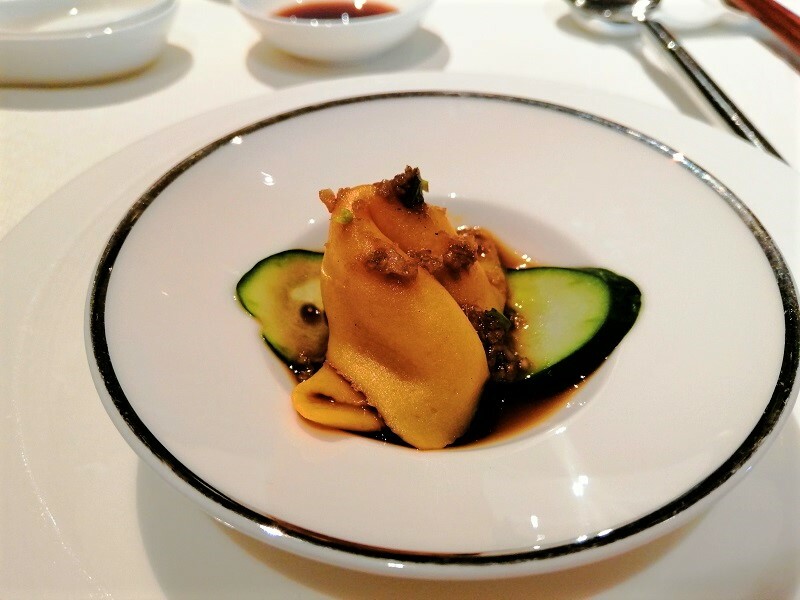 This is a flat, hand-pulled noodle served with XO sauce and fish pieces. It was served at room temperature – acidic and bright. It whetted my appetite nicely. Deep Fried Prawns with Wasabi Mayo. What a strong start to brunch! Everyone at the table gushed about these delicious prawns, even my dad. I had to scheme to get more than my fair share coz there were 6 pieces in total. I ended up popping 3 of these babies into my mouth. The wasabi adds a faint kick to the delicate, naturally sweet prawns and made me want more. There are bits of mango inside too – sweet, crispy, tender, savory, this dish hits every single taste bud and texture. 10/10. Baked Chicken Tart with Baby Abalone. Omg! Just wow. 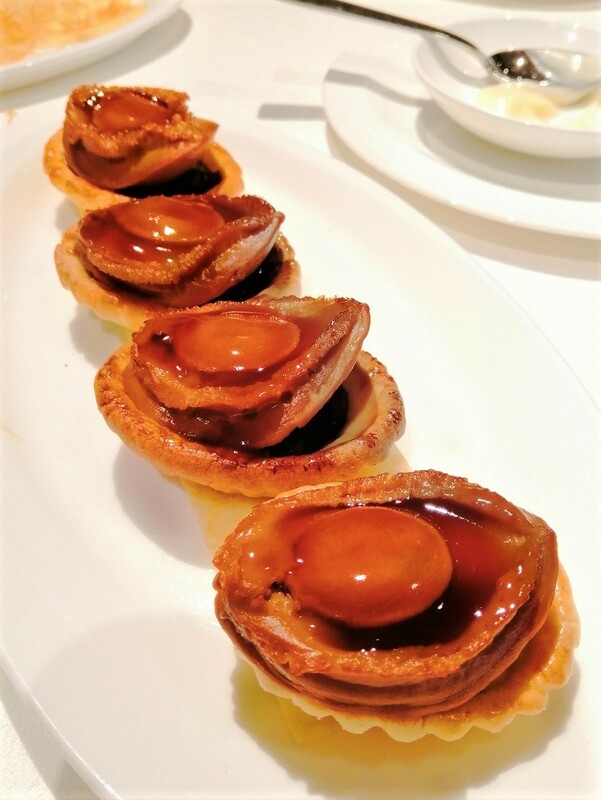 Perfectly cooked baby abalone on top of buttery tarts. The crust is very crumbly and rich and the abalone was soft, tender and flavorful. We were all super impressed by this dim sum. Simply amazing. Too bad there was only 1 tart for each person. I could easily demolish the whole plate myself. Steamed Pork Dumplings with Dried Scallops. 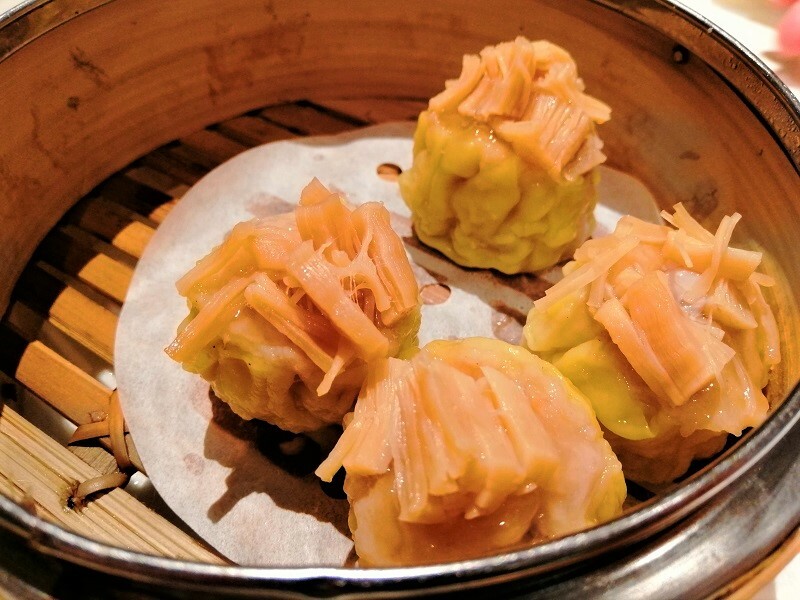 This is an upscale version of siu mai. It’s very nicely done. The dim sum at Summer Palace is elegantly constructed. It tastes refined, like your rich, well-traveled and beautiful aunt who doesn’t look a day over 30. 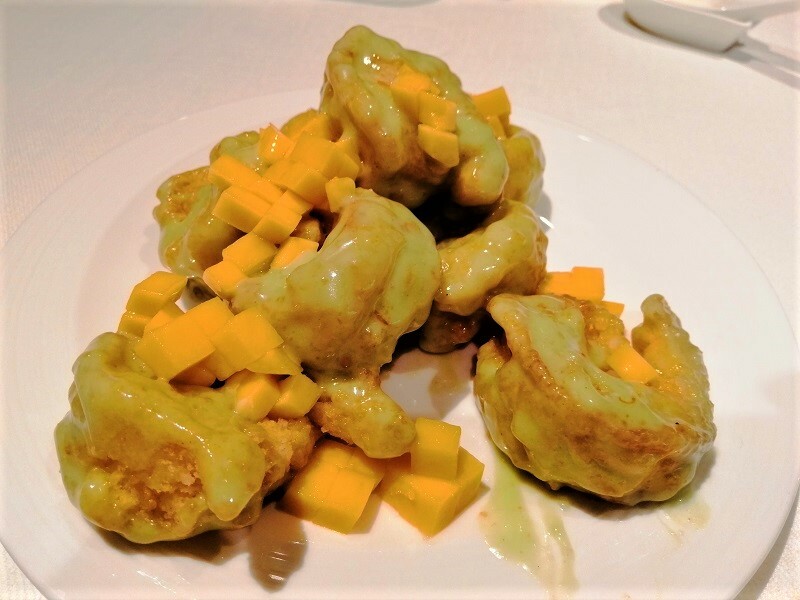 Deep-fried Prawn Rolls with Mango. I love the rolled and deep fried wrapper. It’s so crispy! There’s a side of sweetened Japanese mayo as a dip and everything comes together perfectly. It’s delicious and contemporary – like your cool, edgy brother who married a hot Brazilian and now has beautiful, blended babies. I love how the quartet of dim sum offerings has 2 steamed and 2 baked/fried offerings so you have textural variety. 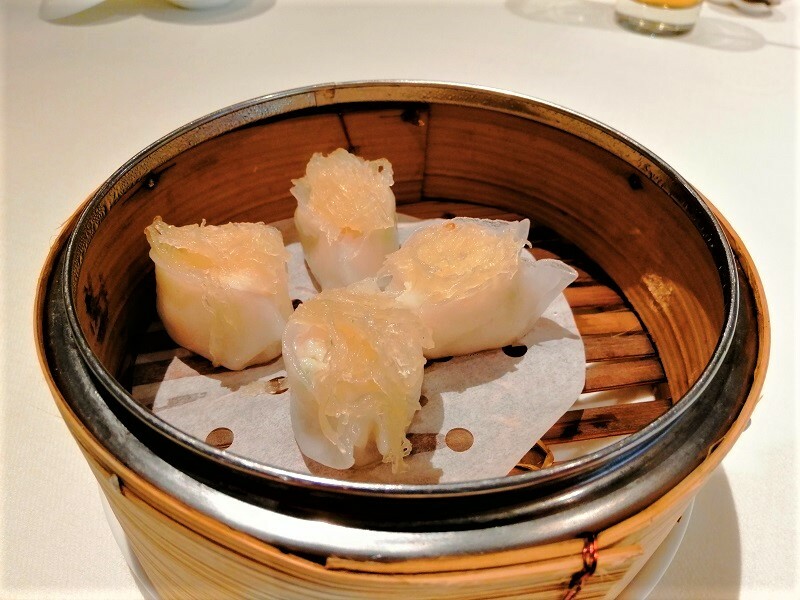 Steamed Prawn Dumplings with Bird’s Nest. This is very refined! As cultured as your young sister with long, straight, black hair who dresses in qi pao and plays the er hu. 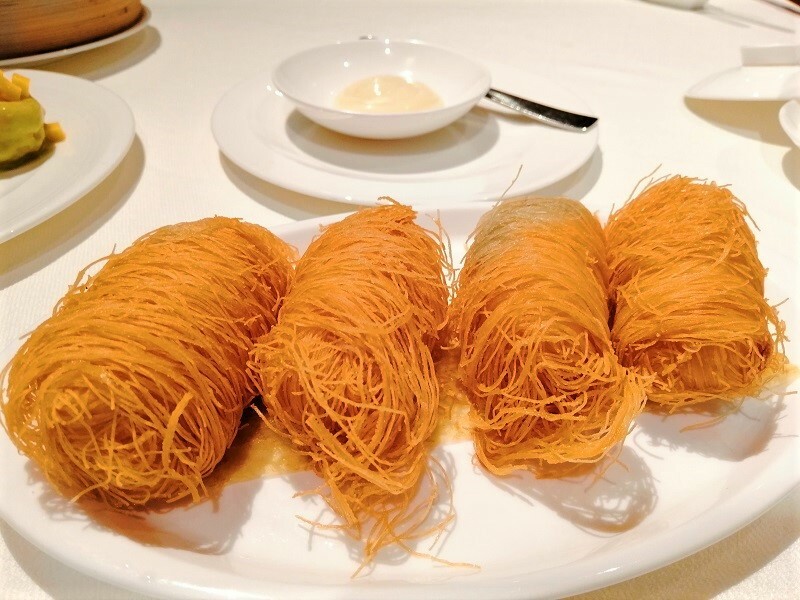 The sweetness of the prawns go well with the bird’s nest, which adds a pleasant texture to your chew. 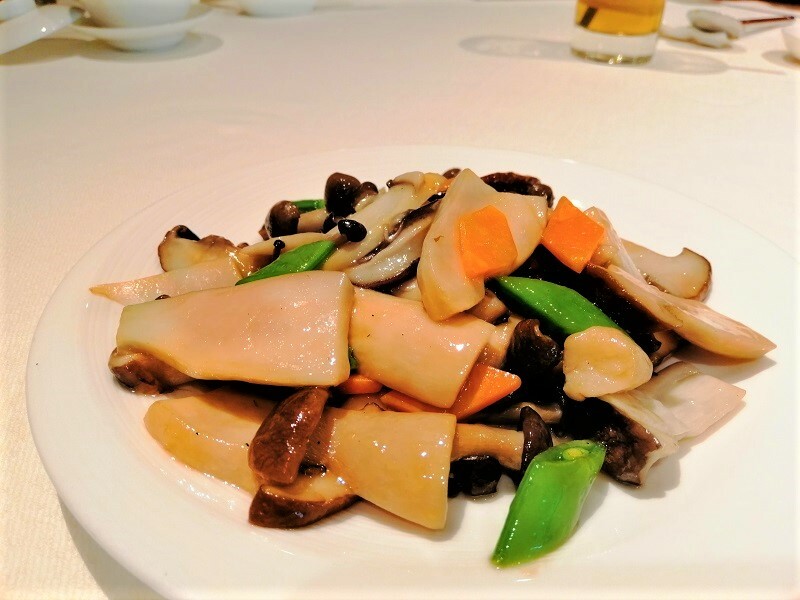 Sautéed Mixed Mushrooms in Zhen Jiang Vinegar. I’m told this is a famous black vinegar from China. It’s the base for this dish of assorted mushrooms. This is as delicate as your second cousin who never leaves home without an umbrella to shield her fair, white skin from the sun. It stands head and shoulders above the disappointing version by Crystal Jade Golden Palace. Soup of the Day was Fish Maw and Chicken Double Boiled Soup. The fish maw was the highest quality I’ve ever tasted! This ain’t the cheap swim bladders your grandma uses for her daily soup. It’s a huge portion that’s slippery and full of collagen. 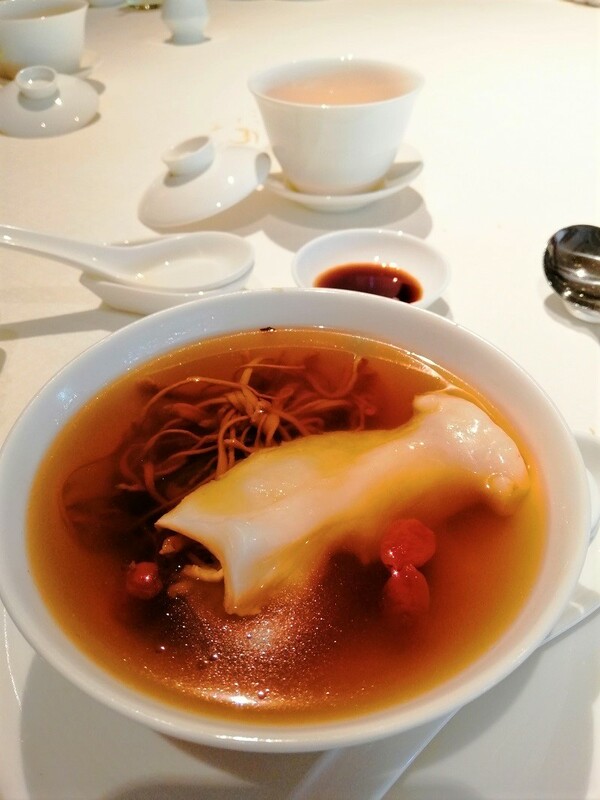 I liked the intricate balance of Chinese herbs in the soup too. Very good. Chef’s Signature Roast Meat Platter. Suckling Pig. Roasted Duck. Honey BBQ Pork. Jellyfish. 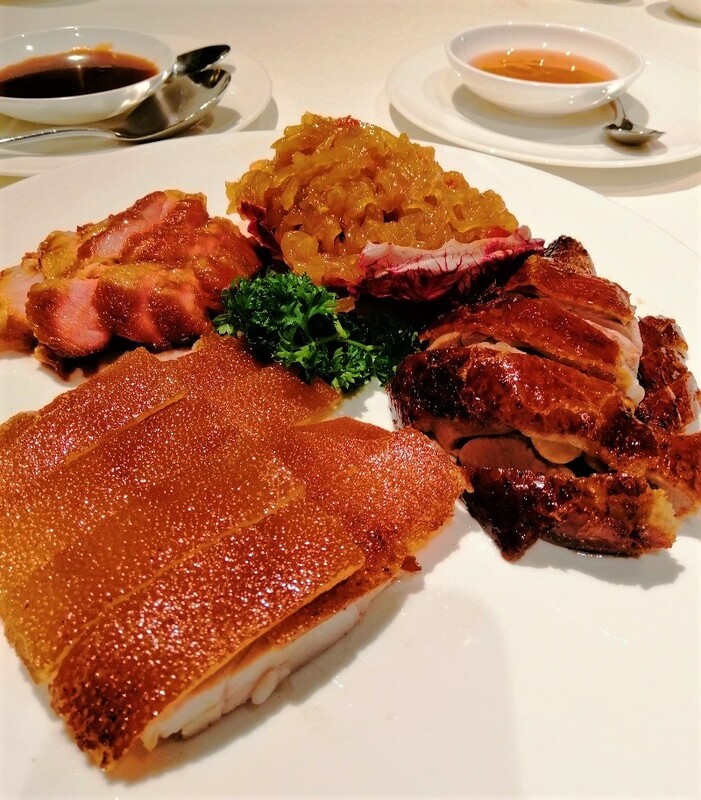 I liked the crispy skin of the suckling pig but the roasted duck was too oily for me. Maybe I was beyond full at his point so I didn’t appreciate the rich flavors. 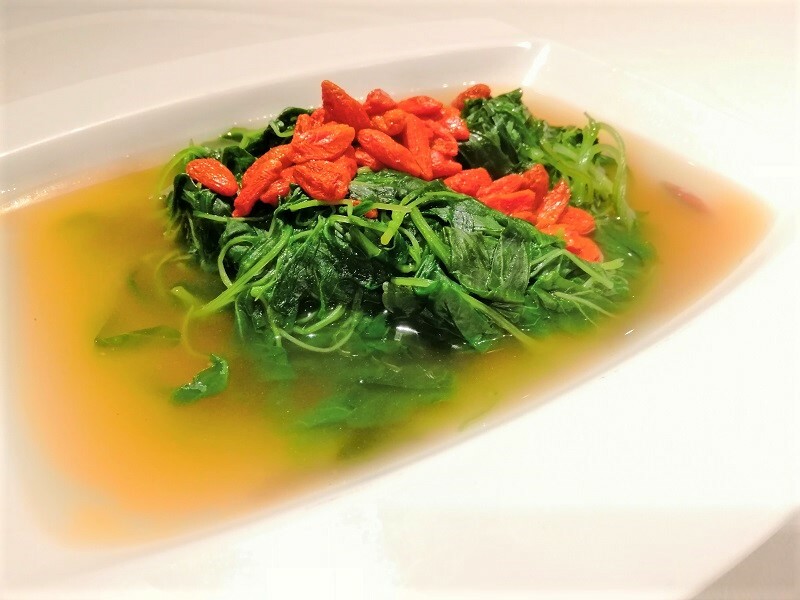 I can see why the jellyfish it there – the acidic marinate and clean texture helps cut through the fattiness. I did enjoy the Honey BBQ Pork though. It’s done very skillfully. Steamed Soon Hock in Superior Light Soya Sauce. Excellent! 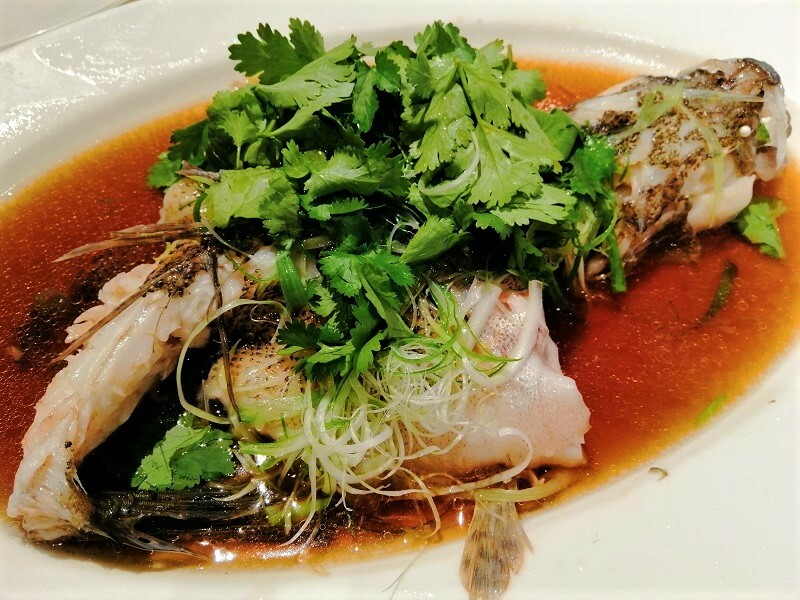 I love the fish in Chinese restaurants and this was a whole marble goby in delicious, sweet and coriander-scented soy sauce. The waitress portioned this nicely for everyone, with an additional portion of the head as extra. I devoured my portion and the head, even though I was stuffed. Poached Vegetables with Superior Stock. The food here is of such high quality even their vegetables are delicious! The plain flavors were a welcome addition after the previous oily course. I like how well they thought through the sequencing of the courses and dishes. Despite being simple, it was tasty. 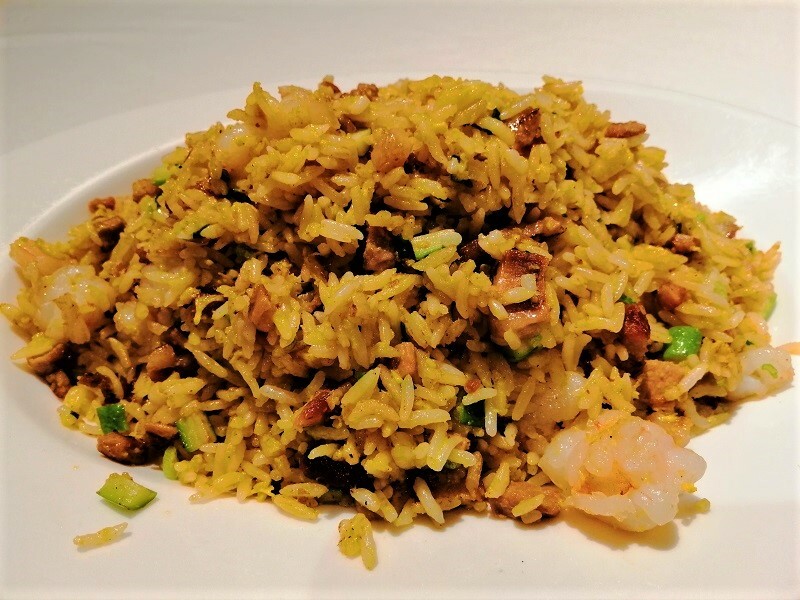 Fried Rice with Prawns and Honey Pork. We were all filled to the brim at this point so we only had a small tasting portion. Each individual grain of rice was visible and there’s lots of goodies like prawns and BBQ pork inside. It’s a bit too oily for me. My niece and nephew enjoyed it though so we packed this home for them. Chilled Lemongrass with Aloe Vera in Lime Juice. A sweet end to a heavy brunch! There’s a lot of different textures in this bowl and the complexity of flavors is surprising. 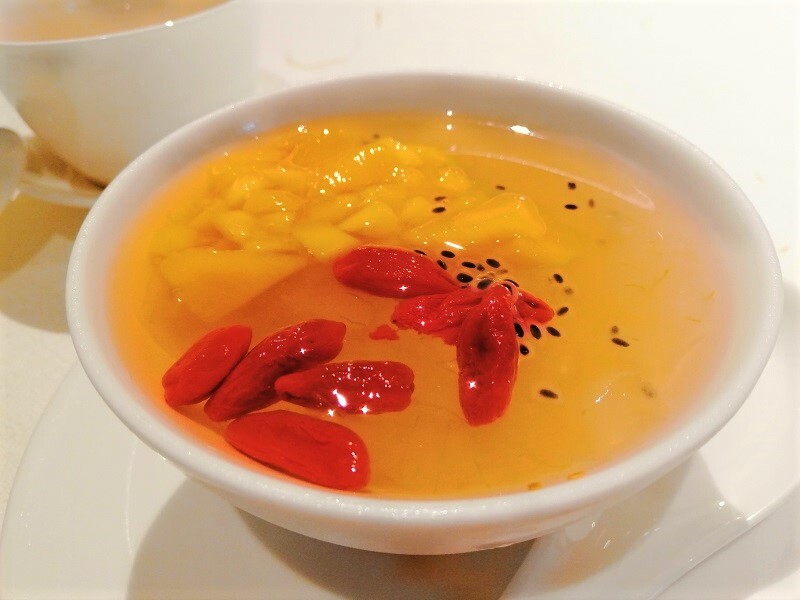 It’s not just sugar syrup but goji berries and other Chinese herbs in the dessert. We all enjoyed the refreshing end to the meal. All of us had nothing but good things to say about Summer Palace. Service was attentive and friendly. The food was excellent. My brother-in-law paid for the meal so I didn’t know the exact figure, but I peeked and it was slightly over SGD 300. The kids had some dim sum before I arrived, as well as drinks, and we all had Chinese tea. My sister said Din Tai Fung can be more expensive sometimes so it’s really great value. I personally think SGD 56/pax for this amount of high quality cooking is a steal so if you can scrounge together a party of 4, I highly recommend Summer Palace’s Weekend Brunch. No wonder every single table was occupied. We all left happy and full.